It's been a very busy start to 2012, and the time I've had for modelling has been at an absolute premium. Between travelling around the country for my work (I was in Arundel yesterday - a beautiful, magical place), sorting out the plethora of paperwork for my forthcoming children's book, and various other family related odds and ends, any time to dedicated to modelling has been solely confined to snatched moments in the dead of night! That has not stopped me from pressing on with the 60503 build, though sadly I'm not as far enough along as I'd like to be at this point. A set of Archer's resin rivet sheets arrived this week, so I thought I'd have a go this afternoon. Now this particular build is something of an experiment. There's no way it is going to be a model of museum quality, that is for certain, but the lessons learned from this build can be applied later in life to those that follow. The one thing which has struck me about 60503 is that she has many, many detail differences to her classmates. In 1949, she sported a slightly different smokebox saddle arrangement (which I have tried, with various degrees of success, to replicate here), and a different smokebox superheater arrangement. The latter will be the subject of my next update, no doubt. The washout plugs will be the next to arrive, and will be fitted forthwith. The boiler has been finished in terms of rubbing down the unnecessary details. The cab is finished too, albeit awaiting handrails, which I will try and tackle next time. 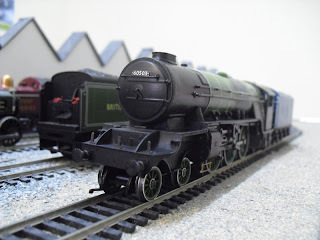 I managed to take 60503 over to a friend's last week whilst passing after work, and she was quite happy working trains of nine Bachmann MK1s without slipping. 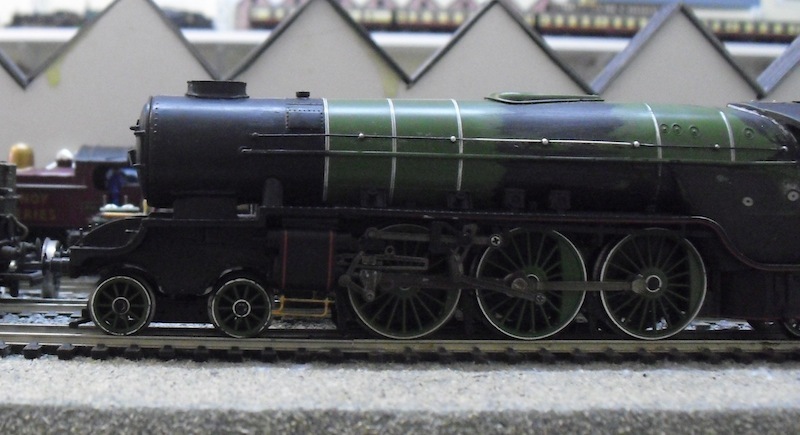 I was delighted with her performance in terms of the valve gear - I had some fears it would all go horribly wrong, but happily an intense six hour session of running in on Thursday last week has paid dividends. So that's my not-quite so brief update on 60503 as it stands. 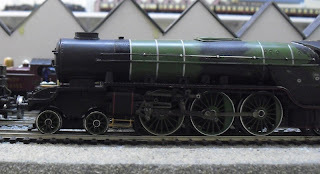 If time allows, I should have finished 60503 by the start of May, ready to embark on the next project, which involves a Bachmann A2, a Hornby A3, a Mainline V2 and some more Graeme King resin components...! The devil is in the detail and I am taking my time with planning that one all out.